I have high hopes of taking time to be crafty this Fall. Here are a few things on my list to make. My door is dark wood. It’s always a challenge to get something to stand out. Maybe if the ribbon is really bright orange it will work. Love the feathers. I can only use these outside… Rocky LOVES to eat feathers then proceed to throw up on my rug. A favorite pastime of my cat. These are stickers on the ornaments. What a cute idea! Cut 2- and 3-inch-wide strips of orange and black crepe paper long enough to fit around the lampshade. Fold each strip lengthwise, and using scissors, cut slits 1/2 inch apart to make the fringe. Glue the fringes in place on the shade. Punch orange paper circles and adhere to the shade with glue. 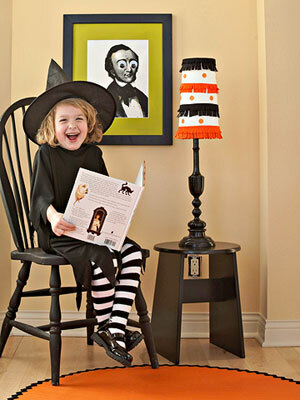 Use double-sided tape instead of crafts glue if you plan to use the lampshade post-Halloween. Check out my personal photos to get inspired for Fall! 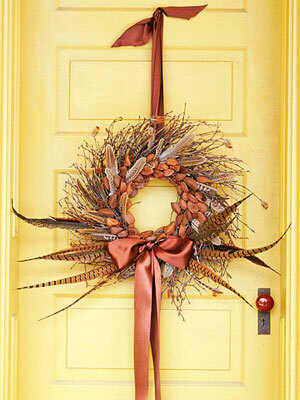 What crafts are you are planning to make for Fall? Leave a comment and let me know about your plans! Love Fall? Join Melissa at the Inspired Room for Fall Nesting Week! Your story was really inmforatvie, thanks! That wreath is stunning! You could do it on a dark door with orange, as you say, or try cream or light beige or light sage. I have a dark wood door, too! Love all these ideas. Isn’t that an adorable lampshade?!? The little girl is a cutie, too! I just bought some ornies for Halloween yesterday. Hubby thinks I’ve flipped!! Those are some great ideas! The wreath is really beautiful. Wow, great photos! Thanks for some more inspiration. You are seriously nesting, YOU GO GIRL! Those little ornies are so cute, what a good idea. For fall, I get started making pomanders. I love having a bowlful on the table in the living room, the fragrance is heavenly. 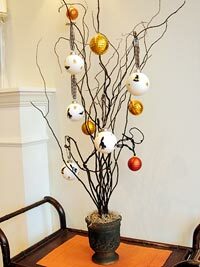 Check out my blog to get a recipe for making a different version of pomanders. There are some fabulous ideas there. 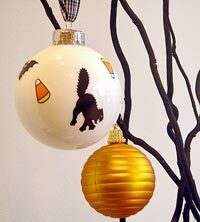 I love the ornaments for Halloween – great idea, I’m doing that as part of our decorations.